Brian K. Vaughan and Fiona Staple’s sci-fi epic Saga has quickly become one of the most critically acclaimed and celebrated comic series published in recent history. 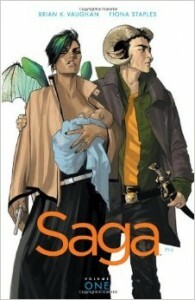 Applauded for its narrative complexity, world building, and characterization, Saga is a pure example of a great sci-fi/fantasy adventure, an instant classic and staple for all comic book collections. With its numerous awards and praise, though, it has also become one of the most controversial comics according to the American Library Association. Challenged for its “anti-family” and “age-inappropriate” content, collected volumes of Saga have had to face criticism and threats of censorship. In hopes of preventing any future bans of this modern classic, we’ve put together these resources for librarians and educators who may need to justify and defend the inclusion of the book in library and classroom collections or curricula. As graphic novels that have faced various challenges and censorship attempts, CBLDF has put together a series of Case Studies that help to explain more about a particular title or series and the specific challenges that they faced. Much like the CBLDF Discussion Guides, the Case Studies can be used as a tool by librarians, educators, and retailers to understand more about the obstacles that certain books have had to overcome to lead more informed and dynamic discussions. You can read the Case Study for Saga here. What should I do if Saga is challenged?